Do you ever enter into giveaways? Me too! This one has a little story. I was perusing my blog list and I was checking out Rita's latest low volume quilt with pink and she had a giveaway, hosted by Fort Worth Fabric Studio. As I filled out my comment I thought, wouldn't it be ironic if I actually won. I did. Yeah! So Fort Worth Fabric Studio, by way of Australia, mailed me this gorgeous fat quarter stack of Raspberry Mixers to Fort Worth. Funny how it works out. I am at a loss as what to make so please, if you have any ideas, tell me!! 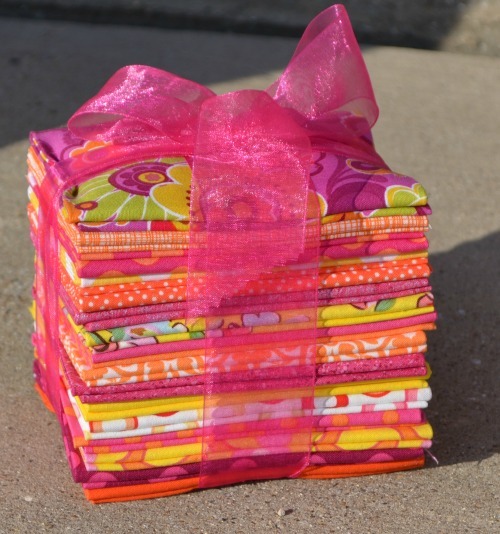 Thanks to Red Pepper Quilts for offering the giveaway and Jodie and Fort Worth Fabric Studio for providing it - I appreciate it! Congrats - it is so much fun to win and this one is a GOOD haul. Quilt, Quilt, Quilt...Enjoy. Congrats on the win! Wonderful bundle to win!